Leaps and Bounds to Everywhere: Twenty-odd days in: I can do this! Twenty-odd days in: I can do this! Last week I posted about my first week of teaching, and although I do not think this will be a weekly post, the second week was pretty dramatically different from the first, so I thought I'd write another. 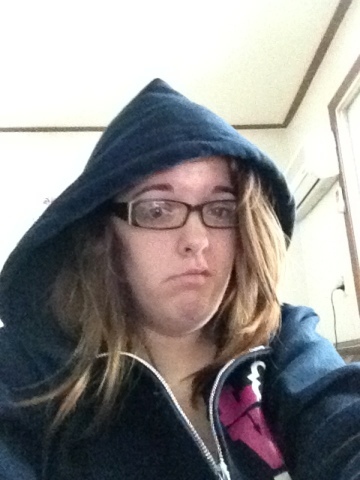 I came down with some kind of miserable sickness last weekend. It involved three days of voicelessness and a whole lot of coughing and a very stuffy nose. I spent all day Sunday chilling in bed trying to heal before finally venturing out to find a pharmacist, realizing this was nothing rest could fix in the 18 before I had to be at work. Not having a voice is not OK when you're a language teacher. After a good bit of effort later I finally found an open pharmacy (most are closed Sunday). Then came the fun part: charades. my frog voice pretty quickly got across the throat problems, and some pointing later I got what I would call some pretty terrible dayquil/nyquil and some kind of thera-flu type drink mix. They helped (especially the drink), but I still chugged and entire big mug of hot tea between each class to get me through just 25 minutes of speaking. Tuesday was a bit better, but still involved lots of tea-chugging. 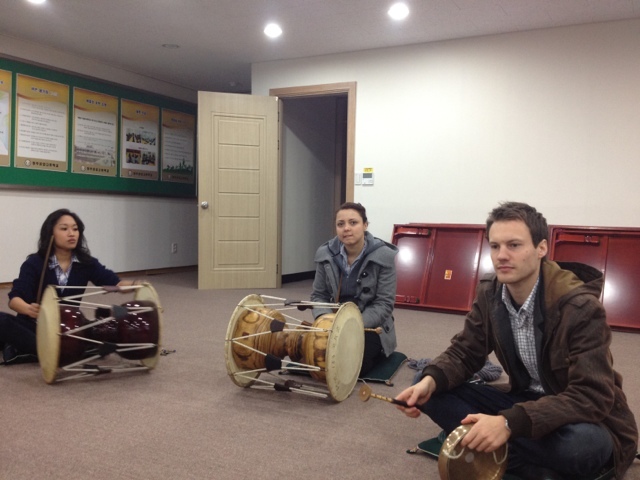 Wednesday was the first day of my Samul Nori (사물놀이) lesson. Samul Nori is a band made of four different types of percussion. The oe I'm playing is not pictured here, but it's called buk (북). It's probably the most familiar to Westerners as it is essentially a base drum. These are some of my Samul Nori-learning classmates. Not the best picture, but you can see some of the instruments. The lesson was a lot of fun, and I got to meet some new people, something I've been working hard to do around here. I actually saw all three of the folks in the picture later in the week (I'll talk about that when I get to the weekend). I also ventured out to another solo restaurant meal, something I have been hesitant to do since my first solo restaurant experience was super awkward. My second experience was significantly less awkward and equally delicious. 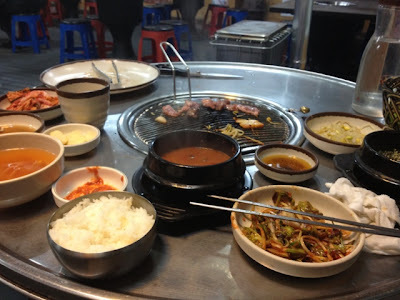 The meal was similar to the previous one I had had solo, Samgyeopsal (삼겹살), it was prepared in the same way and served with essentially the same stuff, but t had a different meat. Not really sure that this is called, but it was delicious. Thursday I had my first actual Korean Bibimbap (비빔밥). Thos of you who keep up with me on Facebook will know that I had bibimbap on the plane, but I feel like anything you have on a plane can't be too official. Thursday's was definitely more delicious. After bibimbap and some exploring, we ended up at a cafe, which brings me to something I'd like to point out to those of you outside Korea. Coffee is really damned expensive here. It's always delicious, but compared to the price of a meal (and compared to how much you would pay back home, the price is crazy. I'm glad I'm not a huge fan, as this means I can just have the occasional sugared-down coffee drink as a treat and not break the bank. I also want to mention my second week of work. My first week was, as expected, difficult. I wasn't really sure what I was doing, had very little information in terms of lesson planning, there were no books the first two days... It was hectic. Week two went much more smoothly. I seem to be understanding the flow of things, the Korean teachers are getting used to me. Many of the kids still call me 'Amy Teacher' thinking I am my predecessor - ironic stereotype reversal that all white people look alike =) I am very excited for week three (though I could do with out the kids who don't cover their mouths) and the rest of the year. I think this is something I can really enjoy doing, and coming to Korea has been an excellent decision for me so far. About that whole 'learning Korean' thing. I survived my first week of teaching!